How much art do you want to have? All the art! 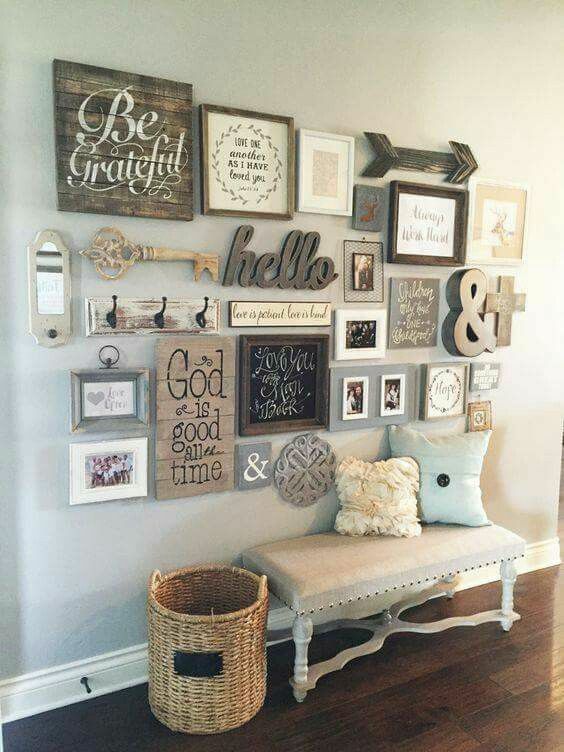 Fill every surface with tchochkes and every inch of wall space with pictures! At least 50% coverage of art. Space to breathe between pieces, but not much space. There should be more art than not-art space! Maybe 30% art? 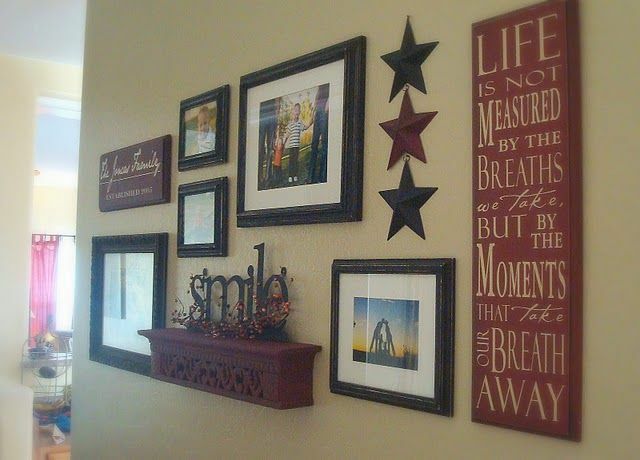 Every wall should have multiple pictures, every surface should have at least one piece and preferable more! At least a few pieces in each room! No need to look like a gallery but get something up there, god! Maybe one or two pieces per room? Curate, curate, curate! Art is for suckers. Do not allow it into your home. All of my pants are wearable art. In an ideal world, how much art would you have on your walls? I'm talking photos, prints, images, sculpture, tchochkes, whether made by professional artists or just instagram snaps you had printed, what would your ideal art coverage be, and why? For a long time, I was kind of in the 'art is for suckers' camp. I had one picture, I liked it, but that was more than enough for me. Now I like to have 2-4 pieces per room, mostly pictures on walls. I'm not a huge fan of dangling crap off of doorknobs and stuff, but some well curated art that is meaningful to me has become something that is important to me. Re: What is the optimal amount of art to have in your home? I like art. When I visit someone's home I'm interested in what art they've chosen to display and I want to know the story behind it. I love when there are little pictures hung in unusual spaces (I had a neighbour who had a picture right next to the toilet, above the toilet paper holder. I have a postcard on the inside of my closet door which I see every time I open it.). What I don't like is when they've bought everything out of a home furnishing store, all generic and matching. It's fine if you buy a random picture you like in TJ Maxx or somewhere, but getting a matching vase and a bowl of straw orbs (or whatever those things are that I see on home improvement shows) just feels really sad to me. Art is supposed to have a meaning to you, otherwise it's just another thing sitting on your shelf that you have to dust. We have a minimum of three pieces of art per room. They aren't necessarily big or expensive, but they're often stuff made by people we've known or have met. At minimum, I want to be able to explain why I value it. An example - a robot. They've been painted onto a woodblock. 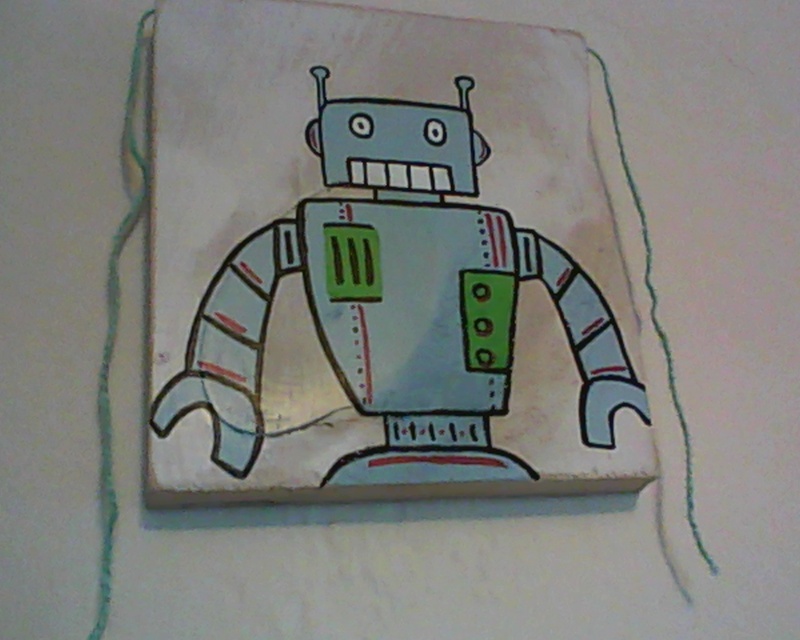 I added the yarn because it was a bit I found that was a similar color - I think of it as the robot's hair. A lot of my art is either art done by family members (I have paintings by my grandmother and my uncle, for example) or given to me as gifts. I have a couple of cross stitched pieces done by my mother or myself. I'd like to piece something using patchwork techniques and frame it at some point, too. I have more art than fits on my walls. I need a tardis-house. My desire goes between "no need to look like a gallery" and "need to look like a gallery". In actuality, most of our walls can't take nails. I like to have my walls at least 50% filled. Every vertical space that could reasonably fit a piece of art on it in my living room has art. I'm a big fan of using tapestries on walls, so the long wall of my living room has two that pretty well fill the space. I have one pretty nice painting that I won at a LGBTQ networking event and the rest were found at garage sales or in piles of things others were throwing out. I make magnets out of band stickers, so my fridge is also very crowded. It's harder to put nails in the walls of my room, so I have just one tapestry and a few small paper posters that just got sticky-tacked up. I have almost no art that requires a horizontal surface, other than the empty wine and whiskey bottles on the mantle. All other horizontal surfaces are reserved for temporary to semi-permanent storage of mail, keys, household tools, etc. I love when other people have lots of art. Like looking at someone's bookshelf, I like the insight into a person through what they find appealing enough to put in their living space. rowan wrote: I have more art than fits on my walls. I need a tardis-house. I paint, I frame pictures, I have little ceramic things, I have funkos, I love every surface to have an item that brings me happiness. I could probably decorate two houses with the stuff I have. My husband's more minimalist then me though so it's a problem. I'd say more than 50% art, some rooms in my house are full to bursting with art. Mostly prints and paintings I have purchased. uglyteapot.comI am an ugly teapot. That ... like tea. Way too crowded, way too much crap. I hated it. I like some art, but not too much. I generally either make my own art (which I tend to not hang up actually), get given art, or buy it from my local craft store when they have a sale. There's usually some reeeeeally nice stuff there then. A lot, ideally, but I'm picky so our walls are mostly bare. I'ma bit of a cultural expat living in the US, so most of my art revolves around Spanish/Caribbean culture. I have some walls almost fully covered, I have a few bare-ish walls. I have a few pieces of art that got away and I can't bring myself to put anything else in the spot I had picked out for them. The art I failed to get when I had the chance haunts me more than the pleasure I get from the art I do have now. I also have some blank spots for some watercolors I want to commission from a talented cousin of mine. But back to your question: It's a matter of whim for me. Whatever feels right.